Never enough peanut butter – Wait…are those…cookies?! Double whammy on the blog posts… I’ve been making interesting things lately, I promise! They’ve just been… ugly. I really didn’t want to show you the amoeba-like beet and goat cheese ravioli… Tasty, but… ugly. Luckily, recipes lately have been delicious AND aesthetic, which appeases the art history major bit of me. Anyway, recipe bonanza for you! Yay. And no. This one isn’t even orange! I told you, we’re striving towards variety! Besides, we have enough orange leftovers to last us a bit… I really don’t think we’re lacking in the beta-carotene department over here. Really. I definitely don’t want to venture into oompa loompa territory. Let’s not. No, this isn’t exactly a recipe, either. It’s a loose adaptation of a noodles and sauce recipe that Gillian and I discovered last year when we were sorta kinda studying for nutrition (but really having much more fun discussing vegan chocolate cake and baking techniques). However. Even though it’s not a recipe, it’s one of my favorites! Infinitely adaptable to whatever you have on hand (or whatever is lurking in the depths of the vegetable crisper), and ridiculously quick and simple to whip up. Besides. Peanut butter is A-MAZING. Well. Actually all nut butters are amazing. I’m surprised I don’t resemble a jar of almond butter (perhaps with an orangeish tinge? Ew. )… I may or may not eat about a jar a week. (And I’ve gotten my roomie addicted, muahhahah). Although now I’ve fallen back in love with peanut butter, so I alternate. But still. There is a ridiculously embarrassing amount of nut butter consumed in this apartment weekly. Going with this vein, I really like finding new ways of conveying nut butter into my face, besides the obvious option of some form of bread/pancake/muffin/scone/carrotish thing. Pasta seemed like an excellent choice…. and then you can decorate with veggies! This way all those antioxidants can have a party in your digestive tract, and in the process, annihilate all of the free radicals floating about and trying to cause problems. And all that whole wheat from the pasta can party with the veggies, increasing your fiberous intake and lowering your cholesterol and blood lipids. Everybody wins! (Except those nasty free radicals, but we don’t like them). 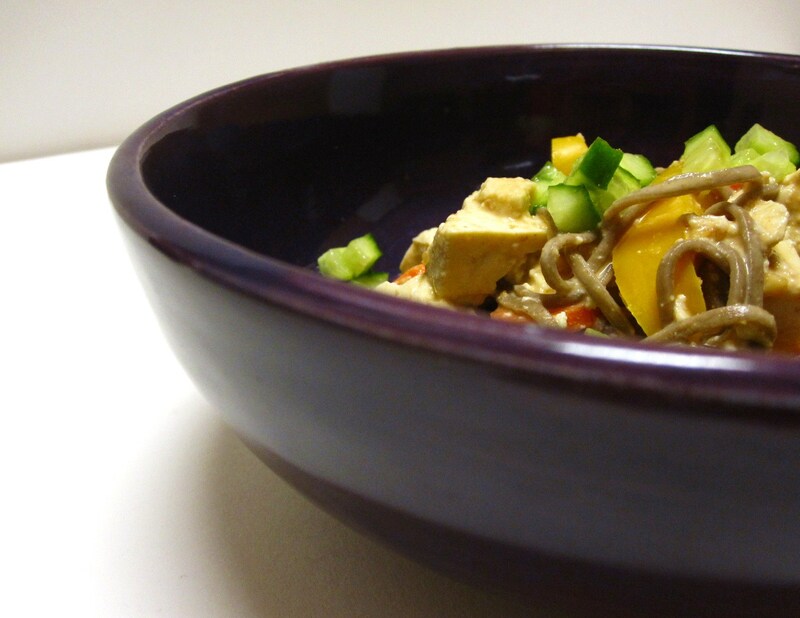 Enter: Peanut Noodles with Veggies! Thai inspired, probably… but eventually simplified to be pantry and budget friendly. YAY! Semi-created by Hayley and Gillian. Simple, really. Boil water! 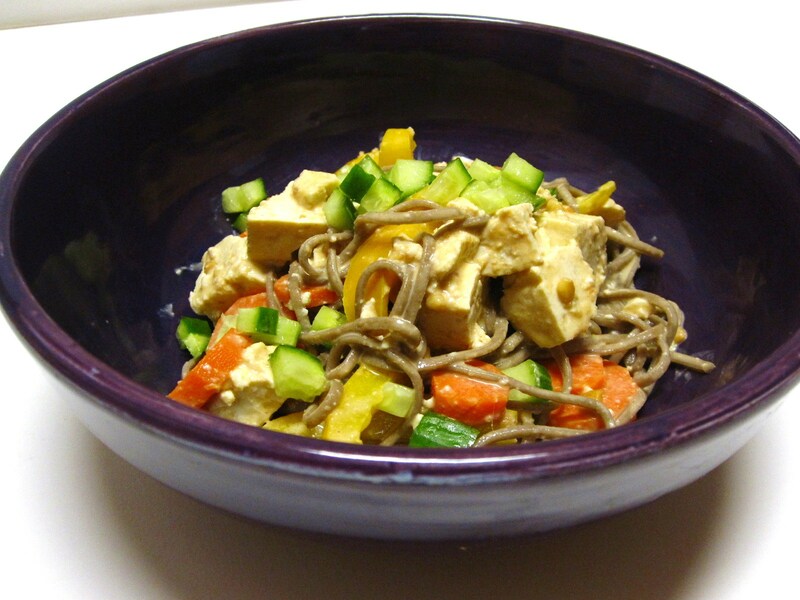 Choose your fave pasta (I like whole wheat soba for this, but whole wheat spaghetti works too), and cook it until al dente (eewww, please no soggy pasta). Drain and rinse. Slice up a block of tofu into smallish cubes, and set aside. Sriacha, if you like it spicy! Keep in mind all these measurements are approximate—I usually taste and fiddle as I go along, and I never measure for this one. Mix everything together until the consistency is as you like it, then let your cubed tofu marinate for a bit. While the noodlies are cooking, steam or saute veggies of your choice. I like bell peppers, broccoli, snow peas, or carrots—crunchy veggies are always good in this. We topped ours this time with diced cucumber, which was quite tasty. 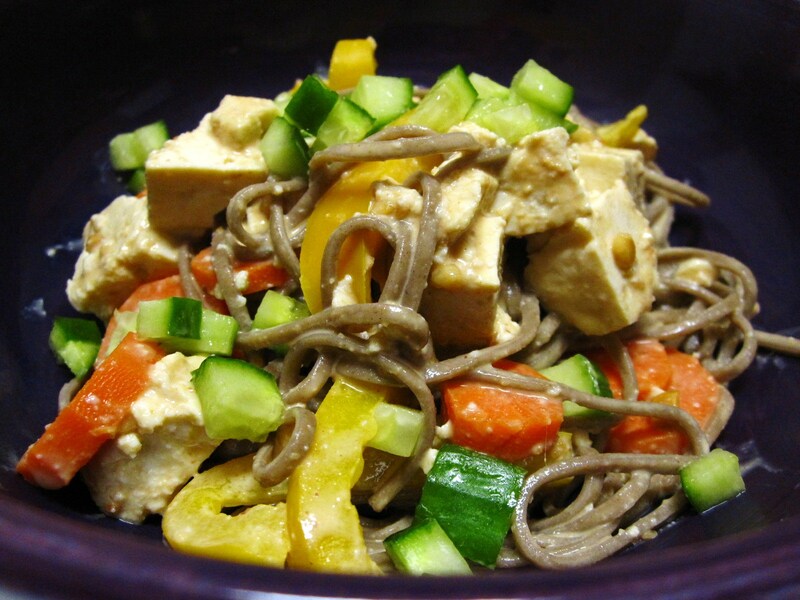 Toss the marinated tofu and sauce with the veggies and noodles, and serve. Eat. Love! I love the peanut butter progression paragraph! Lots of smiles in that one. Mmm…peanut butter really does make everything better! Previous PostPrevious I am the Queen of Orange! Next PostNext Super Squash Strikes Again!